Does insulation effect the efficiency? If your home has a high level of insulation it will be more efficient and cost effective. Insulation helps retain warmth in your home. 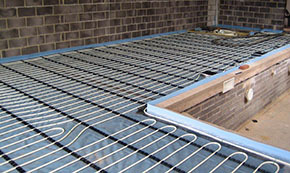 Warmth is passed from the floor into the room so it’s important that the level of heat lost into the ground is minimised. To do this there must be an adequate level of floor insulation. Adding additional insulation is something to seriously consider when you are installing under floor heating into an older property. This is as older buildings tend to have a high level of heat loss. The cost of energy is continuing to rise in the UK so increasing the level of insulation in your home can help to lower the level of energy you use, saving you money.